As we’ve been going through these chapters about the temple, I am finding that there is a certain depth of understanding that comes from having actually been in Jerusalem to observe and witness the politics and religious passions which are concentrated on this small plot of ground where the temple stood. The top of the temple mount where the Hebrew temple(s) stood has been controlled by muslims since they took over the city in 637 A.D. To this day the local muslim authorities control the site on which stands the iconic gold Dome of the Rock and the Al-aqsa mosque. Being in the nation of Israel, the Jewish authorities have ultimate control of surrounding area, and the western foundation of the temple mount has become sacred ground as it is the site of the Wailing Wall. The eastern side of the temple mount falls sharply to the Kidron Valley and to the Mount of Olives on the opposite side. 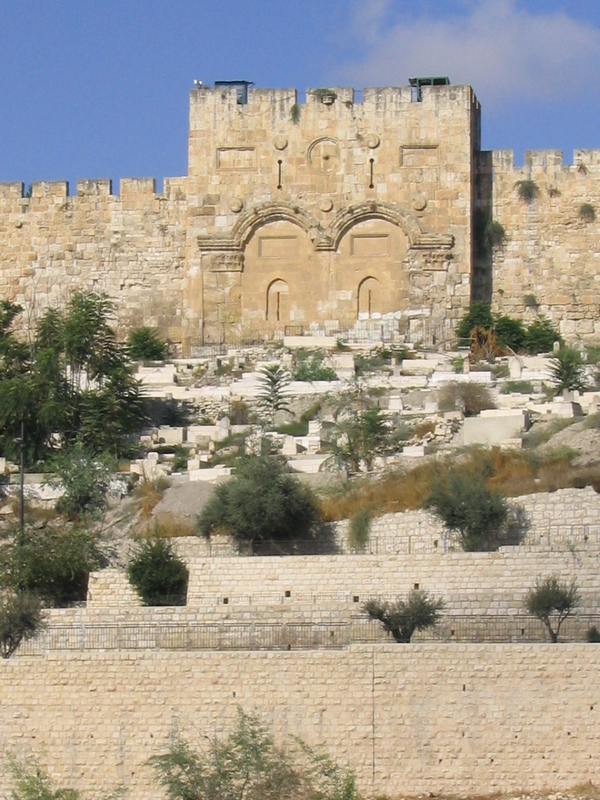 When you stand on the Mount of Olives and look up at the Temple Mount you see the Eastern Gate, or “Golden Gate,” which opens onto the Temple Mount from the east. It is the gate that some Jews believe the coming Messiah will enter the temple that has yet to be built. It is the gate that some Christians believe Jesus will enter when He returns in the end times. Ironically, the muslims bricked up the gate, and the gate is shut much as described in Ezekiel’s vision. I do find the intersection of prophecy, history, and current events to be a fascinating thing to ponder. If you believe, as I do, that there is a story being told across history and that future events have been prophetically foreshadowed, then current headlines and the ebb and flow of events take on new layers of meaning. As always, I find myself seeking truth at the point of tension between the two extremes of making too much of these things and ignoring them all together.